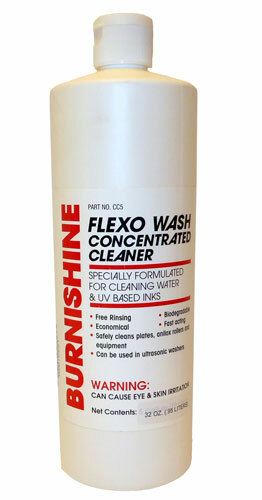 Burnishine Flexo Cleaner Concentrate is an outstanding, versatile product that safely cleans plates, anilox rollers, and equipment. Its concentrated formula cleans metal, plastic and rubber surfaces, and can be used in ultrasonic units. Dilute up to 1:10 with water. Spray, brush or mop onto surface. Rinse with clean water. Dilute up to 1:6 with water. Apply and wait a few minutes for solution to work. Rinse with clean water. Product is hazardous in all modes of transport. Volume allows it to be shipped by air.